In spring 2011, director Stig Björkman meets Ingrid Bergman's daughter Isabella Rossellini and she suggests him to "make a film about Mama". Through Isabella, Stig is able to tell Ingrid's story through her own words and images. 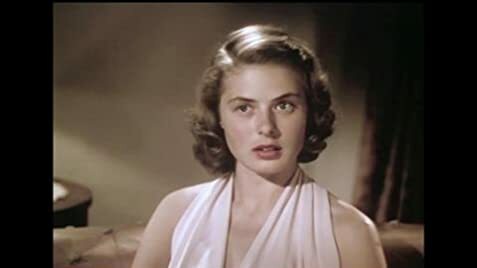 Seven time Academy Award-nominee and three time Academy Award-winner Ingrid Bergman was one of the most talented actresses of Hollywood's Golden Age with great performances in films such as CASABLANCA (1942), GASLIGHT (1944) and and AUTUMN SONATA (1978). Through never-before-seen private footage, notes, letters, diaries and interviews with her children, this documentary presents a personal portrait and captivating look behind the scenes of the remarkable life of a young Swedish girl who became one of the most celebrated actresses of American and World cinema. Greetings again from the darkness. A seven time Oscar nominee and three time winner. One of the best known and most beloved actresses of all-time. Fifty year acting career. Died at age 67, mere weeks after her final performance. These are all bullet points to highlight Ingrid Bergman, the cinematic icon. However, documentarian (and fellow Swede) Stig Bjorkman pays little attention to the icon, and instead focuses on the woman. often in direct opposition to what societal norms dictate. The film neither defends nor celebrates her free spirit; it simply reports it and allows us to sit in judgment, should we be so inclined. one of her husbands and some combination of her kids. Not fitting into the typical "motherly" box, Ingrid spent an enormous amount of time away from her kids as they were growing up. She clearly loved them very much, as evidenced by the words in her diaries and letters, and the visuals from their time together. And the interviews with her children today make it obvious they viewed her as a fun friend, rather than the nurturing mom. a pregnant Ingrid left her first husband (Petter Lindstrom) for her director-lover Roberto Rossellini. For the times, this was extreme impropriety and there were even boycotts of her films. No place was harder on her than the United States. Absolutely unapologetic and without remorse, Ingrid took her career to Europe. Ingrid and Roberto had three kids together, and since history has a way of repeating itself, it was only a matter of time before Roberto was with his pregnant girlfriend in India, and Ingrid moved on to producer Lars Schmidt (and his private island). The most impact from the timeline comes courtesy of the four adult children as they recall the extended times away from their mother, followed by memorable and fun stints together. Of course, they have each had many years to come to terms with a mother who frequently chose pursuing her career dreams to spending time with them. Imagine having a mother who said "I belong more to the make-believe world of theatre and film". It can make you tough and independent, or it can have the opposite effect. We hear each of them discuss. 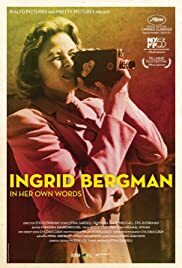 This is the wrong place to look for a career retrospective of Ingrid Bergman the actress, but it's an intimate and fascinating look at a woman who understood what was important to her, and refused to be ruled by societal expectations. Young Swedish actress Alicia Vikander provides voice-over for much of Ingrid's written word, but it's Ms. Bergman's actions and the insight from Pia, Roberto, Isabella and Ingrid that complete the full portrait of a most unusual woman. Ms. Bergman died in 1982 (age 67), just weeks after her final role in the TV movie "A Woman Called Golda"... a fitting portrait of another woman who lived life by her own rules.